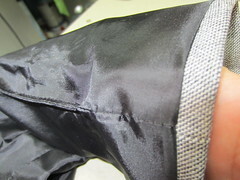 What I'm Altering Today: How Do I Get Inside this Coat Lining?? Great site! 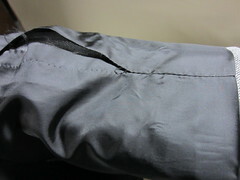 Here's my dilemma- I have a men's suit coat; the two pockets are torn from the outside corners, approx one inch down. Hands in pockets, anyone? Should I separate the lining from the jacket, stabilize the tear with fusible interfacing then stitch with a narrow machine zigzag, or hand sew from the outside and hope for the best? I advised her against hand sewing. This is obviously a point of stress on the garment, so hand stitches won't hold. I would also use a three step zigzag, if you have one. I use it for all my mending. Below I show photos of how to get into the lining so the client will never know. First of all, you need to turn the sleeve inside out. 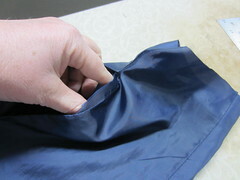 With the lining showing, rip the stitches from the underarm lining seam to create a "hole" about 5 or 6 inches long. This is your point of entry. So here you see how big the hole is that we created. If you are working on something in the body of the coat, like Karen is, you can reach all the way up the sleeve, through the armhole and down into the jacket. The only time this doesn't work is when the armhole stitching connects the lining and coat. Now you can insert your hand. Here I am working on the sleeve hem. I only need to reach in toward the sleeve bottom. I will then grasp the area to be sewn and pull it through the hole, so I can work on it without disturbing the rest of the coat. After doing the sewing, push all the coat part back into their original positions. Make sure the lining is not twisted. 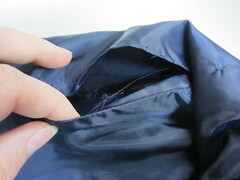 Align the seam edges and sew close to the edge, as shown here. Turn the sleeve right side out and you are finished. The client will never know. After all, who checks out the inside of their sleeve lining anyway?